What the Hell Is Going On With the Avengers in the Comics? It’s taken them a while, but Tony Stark has finally, officially brought back the Avengers for Marvel’s All-New, All-Different universe! It’s about time, especially when you realize that Marvel has been putting out two additional Avengers comics for several months now. Confused? We can help. A quick recap: late last year, Marvel rebooted its entire comic book universe, declaring that an “All-New, All-Different” one had taken its place. So far, that’s lead to three comic books coming out bearing the Avengers name: Uncanny Avengers, by Gerry Duggan and Ryan Stegman, New Avengers, by Al Ewing and Gerardo Sandoval, and All-New, All-Different Avengers, by Mark Waid and Adam Kubert. The thing is though, in the comics themselves, the Avengers haven’t existed in an official capacity until this week’s release of All-New, All-Different Avengers #3. After spending the last two issues haphazardly bumping into each other, Captain America, Iron Man, The Vision, Thor, Nova, Ultimate Spider-Man, and Ms. Marvel came together to take out a Chitauri warlord called Warbringer. The threat over, it comes to Stark to make the decision to reassemble Earth’s mightiest heroes—but even he stresses that it isn’t guaranteed the team will stick it out. 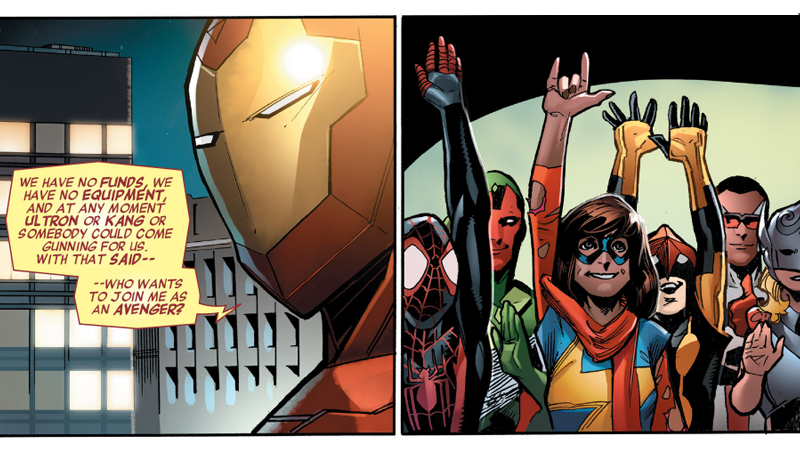 Tony is right in one way—the “main” Avengers team that he has (almost) always funded has been gone from this new Marvel universe. The comic actually starts with Tony himself in the process of selling off Avengers Tower. But he’s also wrong—because they are currently two other teams running around calling themselves Earth’s mightiest heroes at the moment. One is run by Tony’s former friend Steve Rogers (they... had a bit of a falling out in the run up to the Secret Wars event): the Avengers Unity squad that we see in the current Uncanny Avengers series. Unlike the “real” Avengers, they have backing and funding, courtesy of their most unorthodox member, Deadpool. The other is the New Avengers, a group of young upstarts using the Avengers title as a spinoff of the formerly villainous A.I.M. organization who think that they’re the new generation of heroes—and like the Avengers Unity Squad in Uncanny, they have financial backing, too. Of course, just because a team working for a group like A.I.M., reborn or not, call themselves the Avengers doesn’t actually make them Avengers. However, Steve Rogers arguably has just as much right to dub a team the Avengers as Tony Stark does; it seems like Tony is refusing to acknowledge the Avengers Unity Squad solely because he’s pissed at Steve, which is a very Tony Stark thing to do. So the Avengers declared themselves the Avengers, even though there’s already two Avengers teams out there doing all the Avenging they want. Give me a second to dramatically clutch my head in absolute confusion, because it’s hard to wonder how someone as smart as Tony Stark hasn’t noticed this already. It makes you wonder what’s meant to have happened to the Avengers team as we know it in the still-nebulous early months of this “All-New, All-Different” world. Avengers Tower is no more. The world thinks the Avengers are gone, leading to other groups coming together to fill the breach left in their wake. Tony Stark himself has been spending a lot of his own ongoing series, Invincible Iron Man, pondering his place as a superhero. His semi-reluctance in Avengers #3 seems to indicate that he has some beef with the idea of the Avengers coming about again. What the hell could have been so bad that it seemingly fractured Earth’s mightiest heroes so terribly? It might not be long before we find out. Marvel have been teasing that their first major event of the year is called Avengers Standoff, and it’s something that brings Avengers of all ilks—be they Uncanny, New, or All-New and All-Different—to blows over some dark secret. Will it give us an answer as to why it’s taken so long for the Avengers to assemble once more? Let’s hope so. For a team that’s only just come together, it seems like there’s a lot of people running around calling themselves Avengers. Plus, it’d be nice if all this confusion about who is and who isn’t an Avenger could be cleared up before my head hurts any more.